What Are the iPhone XS, XS Max, and XR? Simply put, Apple's 2018 iPhones — the iPhone XS, iPhone XS Max, and iPhone XR — aren't as big an improvement over the iPhone X as the X was over its predecessor, the iPhone 7 series. Now, that doesn't mean that the XS and XR don't have a lot to offer. The internals have changed so they're faster and even offer one particular feature that's totally new to the iPhone series. A Huge Screen: The iPhone XS sports the same 5.8-inch screen as the iPhone X, but the XS Max offers the biggest screen ever on an iPhone, at a huge 6.5 inches. The XS Max may be too big for those with smaller hands, but no iPhone screen has ever looked this great. A Fantastic Camera: The XS and XS Max use the same camera, and it's fantastic. We know it's so good because it's virtually the same camera as used on the iPhone X. It takes 12 megapixel photos, offers wide angle and telephoto options, optical and digital zoom, Portrait Lighting, 4K video recording, and much more. The XS and XS Max add a few wrinkles, including stereo sound for video recording. Up to 512GB Storage: The XS and XS max double the maximum storage capacity on the high-end iPhone to 512GB. According to Apple, that's enough for a couple hundred thousand photos, plus other data. Dual SIM: Thanks to an innovative dual SIM system, the XS and XS Max can have two phone numbers assigned to the same phone. The first SIM is a physical SIM card, the kind used to connect to phone company networks. The second eSIM is totally software-based. This will make overseas travel easy; sign up for local service wherever you are using the eSIM without swapping your old SIM or losing access to your old phone number. Improved Internals: The XS and XS Max are built around internal components that improve on the iPhone X. The A12 Bionic processor in both phones is faster than the A11 in the iPhone X (just how fast depends on what the phone is being used for). The battery provides 30 to 90 minutes more life on the XS and XS Max, respectively, as compared to the iPhone X. Better Protection: The dust- and water-proofing on the XS and XS Max meets the IP68 standard, offering waterproofing for up to 30 minutes in 2 meters of water. Standard iPhone Features: Like every iPhone, you'll find key Apple features and technologies like Apple Pay and Siri on the XS and XS Max. And, like their predecessor, these models use Face ID for security and authorizing transactions. 6.1-inch LCD Screen: While the iPhone XR doesn't have the hegh-end OLED screen from the iPhone X or XS, it does sport a solid 6.1-inch LCD screen. Don't let folks convince you that because it's not OLED it's not good. This is the best LCD Apple has shipped. The XR's screen does not support 3D Touch. A12 Bionic Processor: The XR is built around the same powerful new A12 Bionic processor. All three models have the same combination of high-performance and high-efficiency chips, and use the same Neural Engine for artificial intelligence and machine learning. A Very Good Camera: The camera on the iPhone XR doesn't match the nearly professional grade equipment on the XS, but it's still by far the best camera most people have ever owned. Its single-lens system offers telephoto images, hardware-based image stabilization, 4K video recording, and some Portrait Lighting features. Three Storage Options: Because the XR is a mainstream phone, it offers a wider range of storage options. Choose from 64GB, 128GB, or 256GB to meet your storage needs and your budget. A Compelling Price: The 64GB iPhone XR starts at US$749. While that may seem like a lot for a smartphone, it's $200 less than the lowest-priced iPhone XS and puts this highly functional, high-end phone in reach for many people. 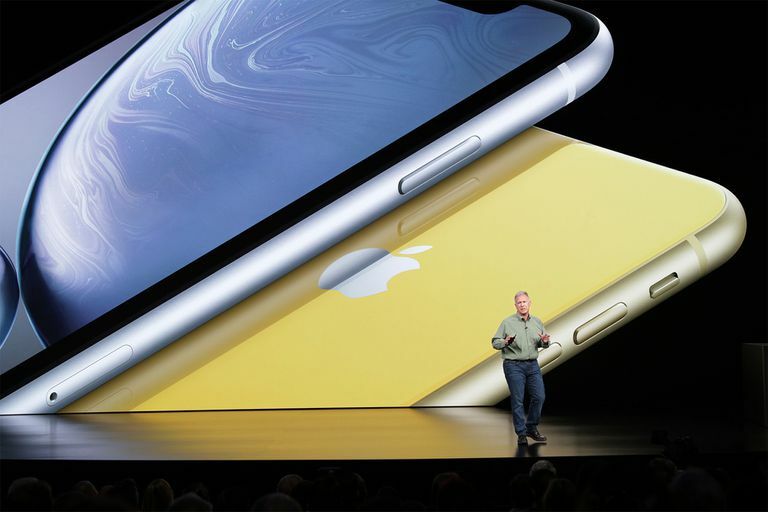 Standard iPhone Features: Like the XS series, the iPhone XR features all of the core iPhone technologies, including Siri, Apple Pay, and Face ID. Colors: Here's where Apple is going to steal at least some folks from the XS and XS Max. While plenty of people show off their favorite colors in the form of a case, there are many who go caseless and can show off a color other than silver and various shades of gray. What About the iPhone X, iPhone 8, and iPhone 7? Despite the introduction of new models, many previous iPhones are still around. This has been Apple's pattern in recent years: Introduce new models and keep the old ones around at lower prices as attractive options for more budget-conscious consumers. In this case, Apple is continuing to offer the iPhone 7 and iPhone 8 series phones, starting at less than half the price of the iPhone XS. The iPhone X will be replaced entirely by the XS and XR.